School districts that #GoOpen are committing to transition to using high-quality, openly licensed educational resources in their schools. Consider becoming a #GoOpen NH District. Visit #GoOpen Districts to learn how. Identify a district #GoOpen team who will work to develop a strategy for the implementation of openly-licensed educational materials. Commit to replace at least one textbook with openly-licensed educational materials in the next year. Document and share their implementation process. Download a #GoOpen District Launch Packet. Mentor #GoOpen Launch Districts as they design and implement their strategy for transitioning to openly licensed educational resources. Share the openly licensed materials they�ve created. Increase Equity � All students have access to high quality learning materials that have the most up-to-date and relevant content because openly licensed educational resources can be freely distributed to anyone. Save Money � Switching to educational materials that are openly licensed enables schools to repurpose funding spent on static textbooks for other pressing needs, such as investing in the transition to digital learning. In some districts, replacing just one textbook has made tens of thousands of dollars available for other purposes. Empower Teachers � Openly licensed educational resources empower teachers as creative professionals by giving them the ability to adapt and customize learning materials to meet the needs of their students without breaking copyright laws. The Learning Registry is a new approach to capturing, connecting and sharing data about learning resources available online with the goal of making it easier for educators and students to access the rich content available in our ever-expanding digital universe. What is the Learning Registry? The Learning Registry is an open database where content creators and educators can share information about digital educational resources. The Learning Registry is based on the Learning Resource Metadata Initiative (LRMI) which provides common language for tagging resources according to quality, keyword, and alignment to curricular standards. The Learning Registry supports educator voices to help define which resources are most relevant or useful. Openly licensed educational resources are learning materials that can be used for teaching, learning, and assessment without cost. They can be modified and redistributed without violating copyright laws. Collaborate - Educators can freely work together to create and share resources that are relevant and meaningful to their students. Innovate - Educators can modify resources freely to best fit the needs of their students. Design - Educators are free to develop new materials from already existing materials to provide effective instruction. Curate - Educators are free to select only those resources they need and help their students achieve. Communicate - Educators are free to consult with other educators who use the resources and find what works best. Empower - Educators can take ownership of their lessons, curriculum, and pedagogical practices to best serve the needs of their students. States are powerful collaborators in supporting and scaling innovation. With the launch of statewide #GoOpen initiatives, states are helping districts transition to a new model of learning by facilitating the creation of an open ecosystem of digital resources that can increase equity and empower teachers. The U.S. Department of Education�s #GoOpen campaign encourages states, school districts and educators to use openly licensed educational materials to transform teaching and learning. District and state leaders are working alongside innovators from education technology companies and nonprofit organizations to share effective strategies and ideas, create new tools and provide professional learning opportunities that help educators find, adapt, create, and share resources. Statewide #GoOpen initiatives are committed to supporting school districts and educators as they transition to the use of high-quality, openly-licensed educational resources in their schools. 1. Adopt/Implement a statewide technology strategy that includes the use of openly licensed resources as a central component. 2. Develop and maintain a statewide repository solution for openly licensed resources. 3. Develop the technical capability to publish OER to the Learning Registry. 4. Participate in a community of practice with other #GoOpen states and districts to share learning resources and professional development resources. 5. Create a webpage to share the commitment to #GoOpen and document the state�s progress. The following organizations are committed to support and grow the Open Educational Resources movement. The National Center on Accessible Educational Materials provides resources and technical assistance for educators, parents, students, publishers, conversion houses, accessible media producers, and others interested in learning more about Accessible Educational Materials (AEM) and implementing AEM and the National Instructional Materials Accessibility Standard (NIMAS). 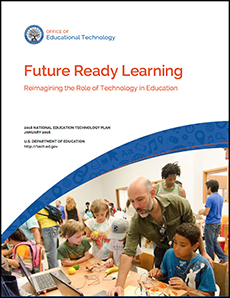 The National Educational Technology Plan outlines a broad vision for how technology should be used and integrated into our schools in order to leverage technology to enable and drive innovation that produces future ready teaching and learning. Consider these broad goals for learning enabled by technology when developing your own goals for your technology planning.